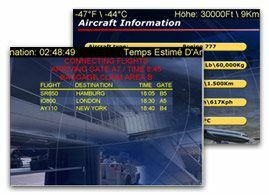 SimiGon's AirTrack® represents the next generation of Passenger Flight Information Systems (PFIS). It is successfully installed and operational on airlines worldwide. Based on SIMbox advanced technology, AirTrack is a cost-effective, rapidly deployable solution for airlines seeking to upgrade their In Flight Entertainment systems. 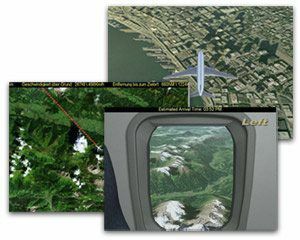 The system capabilities include: hi-fidelity, 360º 3D simulation views, moving maps, outside plane views, dynamic media, real time flight data and news. The potential of providing advertisements and commercials to the passenger generates an additional revenue channel for the airlines and their popularity. 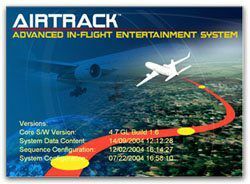 AirTrack's moving map system is based on satellite imagery presenting a "real-world" view for passengers. 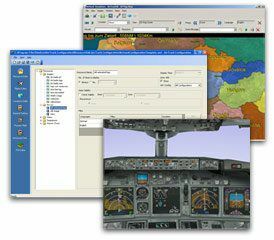 Additional system features are: detailed topographical maps, simulated 3D aircraft views including outside, cockpit, and of the right and left side of the passenger windows. AirTrack is provided with an easy-to-use, PC-based software configuration tool. The configuration tool enables airlines a complete control, independently and rapidly customize in-flight content and upload sequences based on specific needs. The AirTrack system works automatically with ARINC 429 & ARINC 485 without the requirement of human intervention and of the aircraft configuration. The cabin crew work and responsibility would be reduced and the system would enable continuous operation with protected recovery. The air to ground connection is established through the ACARS protocol, enabling the passengers to receive required and useful information such as: flight arrival, connecting gates, news messages and other real time events messages. AirTrack is a well established open architecture framework that can be customized and expanded to provide additional capabilities. AirTrack complies with the From Fit Function (FFF) and fits into the aircraft's existing PVIS mounting tray. AirTrack doesn't require any additional hardware configuration or aircraft wiring. The software is a proven plug & play upgrade over existing PVISs, allowing airlines to effortlessly differentiate themselves in the market, with low switching costs. AirTrack allows airlines to rapidly create new functions and customize the system while dramatically reducing software expenses.